By now, I think you know exactly what Silke are all about; the latest in cutting edge, ultra modern kitchen design and productivity. We’ve built out business model on it, after all. And today’s subject matter is about as bleeding edge as you can imagine. Today, ladies and gentlemen, we’d like to take a little time to talk about Pyrolytic Ovens. I think pretty much everyone has firsthand experience with oven cleaning, and how much of a tiring, tedious, and taxing job it is to undertake. The problem is twofold; first of all, ovens have a lot of space to clean as is. Secondly, the grease and grit that clogs up ovens can be very difficult to shift. It’s no surprise, then, that it’s a job rarely undertaken in the home. Ovens with some form of cleaning capacity have existed for some time. For example, there are ovens with catalytic lining, which gradually break down grime and grease over time (and are great for folks looking for a self-cleaning oven on a budget). There are also options for ovens which utilise steam cleaning instead. Pyrolytic Ovens, however, are a truly modern phenomenon, and are easily the most popular form of self-cleaning ovens on the market. The Siemens studioLine ovens are a great example of this. Instead of relying on a surface that breaks down stains over time or the power of steam alone, Pyrolytic Ovens make use of a process called Pyrolysis. In laymen terms, Pyrolysis is a process in which organic matter begins to decompose at extremely high temperatures. It’s a process that’s very commonly used in the chemical industry. For example, it is used to convert Ethylene Dichloride into Vinyl Chloride to make PVC; it’s also used to produce a number of chemicals and compounds from wood, such as charcoal, activated carbon, and methanol. In Pyrolytic Ovens, it’s used to break down the leftover grime, grit, and grease from cooking. In most models, it’s as simple as programming the function and hitting “start”; the inside of the oven will superheat to incredibly high temperatures very quickly, thermo-chemically decomposing everything leftover in the innards of the oven. By the time the process is finished, all that should be left over is a pile of ash that can be simply dealt with using a dustpan and brush. In a world of appliances that are given Wi-Fi connectivity, it’s often worthwhile to consider how old techniques can be re-appropriated into something modern. 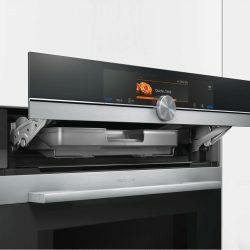 The Pyrolytic Oven embodies this practise perfectly, and for that reason, it’s something we here at Silke are very excited about (well, that and the whole “making cleaning an oven infinitely easier” thing of course).